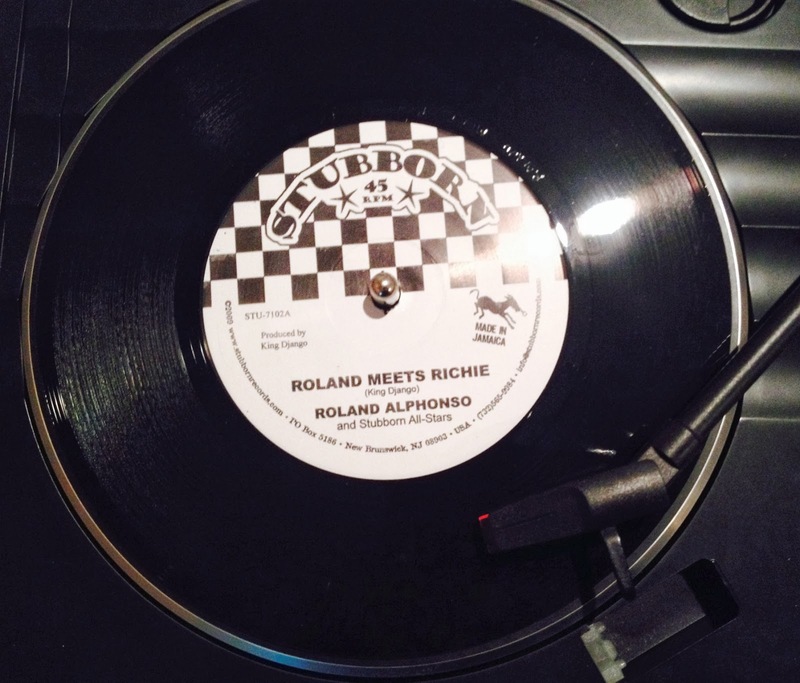 Duff Review: Roland Alphonso and the Stubborn All-Stars "Roland Meets Richie" b/w Stubborn All-Stars "Rich Morrissey"
It's hard to believe that the stunning 1995 debut Stubborn All-Stars album Open Season was released almost 20 years ago (! ), just as the so-called Third Wave of ska was about to burn white hot in the USA. Almost overnight, this supergroup of New York area ska musicians led by Skinnerbox's King Django became one of the most popular and acclaimed traditional ska bands on the US scene (which led to a collaboration with Rancid for the Beavis and Butthead movie soundtrack and a high enough profile for MTV news coverage)--and the Stubborn All-Stars went on to release one of the finest albums recorded of that entire era, 1997's Back with a New Batch (the boys in Rancid and Dicky Barrett of the Mighty Mighty Bosstones lent their background vocal stylings to this effort). This single revisits one of the top, aggressively hard-hitting instrumental cuts off of Open Season--"Rich Morrissey" and its version "Roland Meets Richie" featuring the late great and very much missed Skatalite Roland Alphonso--but these are pristine new mixes that make the tunes sound better than ever. 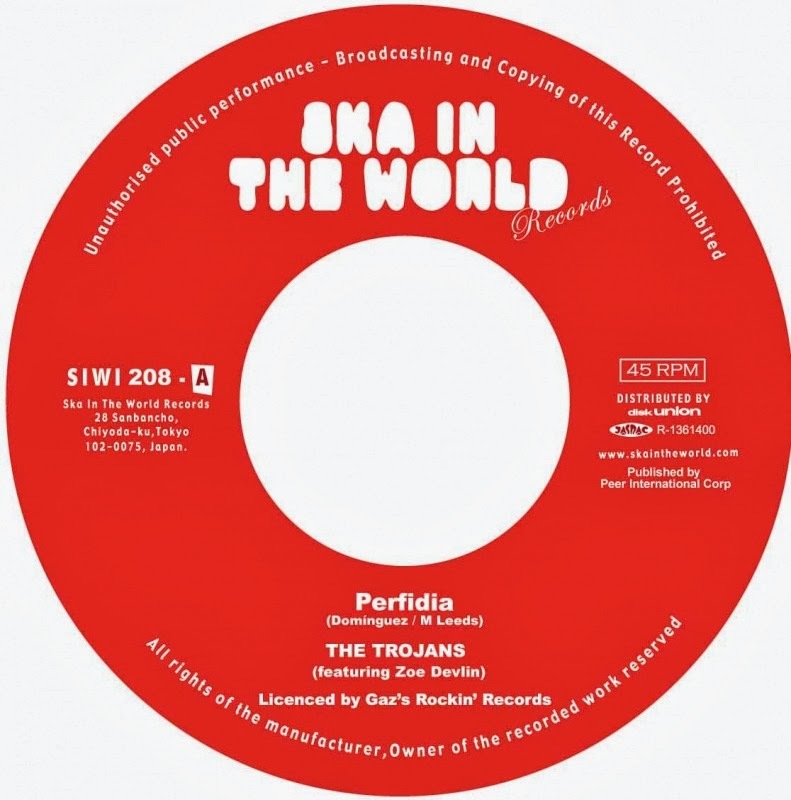 Ska vinyl freaks like me, as well as SAS fans and completists, are absolutely going to want to pick this up for its collectibility (a version of "Open Season" appeared on 1994's "Old's Cool" 7" EP and then two additional versions--the album cut and a 15th anniversary remix--were released on a single in 2009), but it's also a terrific excuse to rediscover just exactly how good these songs were in the first place. Can't beat this: The Beat back in the day! IV Aniversario Skarroneros/Sorfest II w/Skarroneros, Kantuta, Agonia, and more! Rude Boy George "Take One" Digital EP Now Available Everywhere--Plus First 2014 Gig on 2/6! This is another post solely concerned with shameless self-promotion--but I don't feel too bad about it, as what we've got here really delivers the goods. 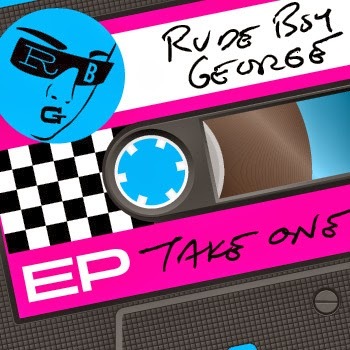 Rude Boy George, the band I'm in, just dropped its debut digital EP called Take One, which is available to preview and download through Bandcamp, CD Baby, iTunes, and many other digital music sites. In addition, you can listen to our tracks on Spotify and Xbox (while you virtually shoot things up). Our first NYC-area gig of 2014 is on Thursday, February 6 at The Grand Victory in Brooklyn with Beat Brigade, The Ladrones, and Sweet Lucy. So, if you're around, definitely check us out--it's going to be an amazing night of music (our friends Beat Brigade and The Ladrones are both fantastic live!). We've got a bunch of new songs in the set, plus we seem to be expanding in all sorts of cool ways. Look for more live dates soon, both in and beyond New York City. And there will be more recorded music coming from us in 2014--some of which may be available on vinyl with your help (hint, hint)! To watch videos of Rude Boy George in action, go to the Duff Guide to Ska YouTube channel. Rude Boy George (www.rudeboygeorge.com) is a NYC-based band that performs ska, rocksteady, and reggae versions of New Wave classics. 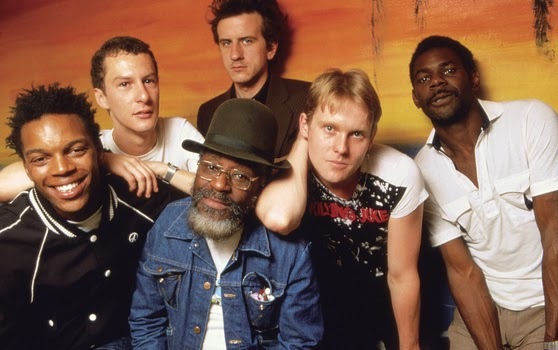 We’re motivated by our shared love and respect for ska (reflected in the reference to 1960s and 2 Tone rude boys) and the extraordinary amount of good music produced in the late 70s and early 80s New Wave/post-punk era (Boy George). And we want to have some fun doing it. That's Rude Boy George’s agenda and mission statement--simple as that. Rude Boy George formed in January 2013 with members drawn from several popular and long-standing NYC area ska bands: Bigger Thomas (vocalist Roger Apollon, drummer Jim Cooper, bassist/Marco on the Bass blogger Marc Wasserman, and guitarist Spencer Katzman), Beat Brigade and The Toasters (keyboardist Dave Barry), and Across the Aisle (singer Megg Howe)—plus a ska blogger/former indie ska label guy (Steve Shafer on backup vocals) thrown in for good measure. The band’s live debut took place at Electric Avenue in Manhattan on April 13, 2013 to a very enthusiastic crowd and the band has been gigging throughout the New York area since. Our perpetually expanding set list includes songs by Human League, Soft Cell, The Romantics, Billy Idol, INXS, The Smiths, Cyndi Lauper, Squeeze, Culture Club, Gary Numan, Psychedelic Furs, Talking Heads, Berlin, and The Pretenders. In May 2013, Rude Boy George recorded three tracks at Bill Laswell’s studio in West Orange, NJ with ex-General Public/Special Beat/English Beat bassist Wayne “Waylo” Lothian producing. The result is our five-track digital EP Take One (with "(Keep Feeling) Fascination," "Don't Change," and "Talking in Your Sleep"--plus two remixes including one featuring Antonee First Class of The English Beat). Plans already are in the works to lay down more tracks in the studio--to be issued in 2014 on a more tangible format.